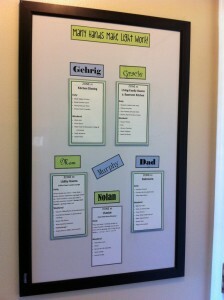 I’ve used many a job chart/reward system in my 9.5 years of being a mom – from store bought sticker charts to cute and crafty ideas to try to keep my kids interested. It seems nothing ever seems to work!!! I kept telling myself “the older they get, the more help they’ll be.” NOT! With each child the messes get bigger along with my frustrations. I didn’t know how to keep a tidy home while being attentive to all my children and their needs, and giving myself personal time. 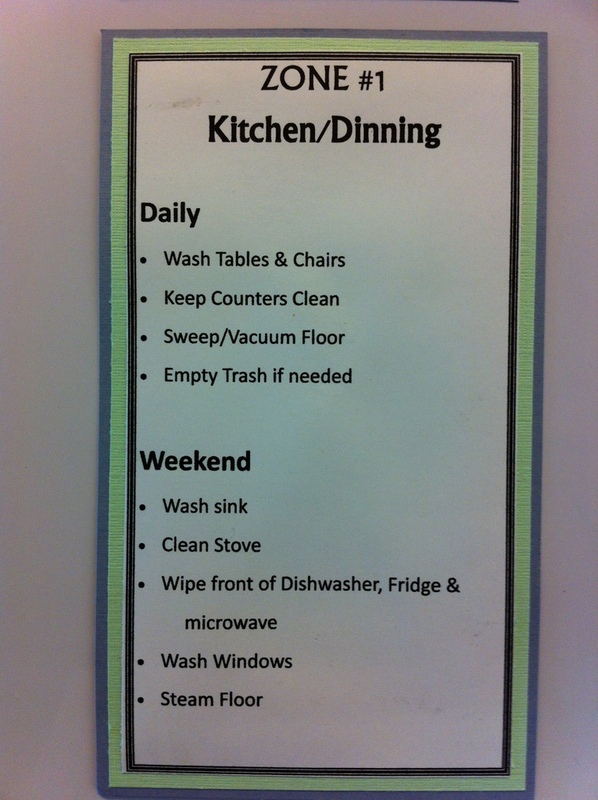 I didn’t want to spend every day repeating the same chores I did the day before. I felt like I was wasting my personal time and time spent doing fun stuff with my kids and family. A clean/ORGANIZED home is very important to me. It helps me relax and feel at peace. But I felt I was sacrificing my peaceful feelings with frustration, disappointment AND the things that mattered most. There are 6 of us. One too little of course for his own zone. 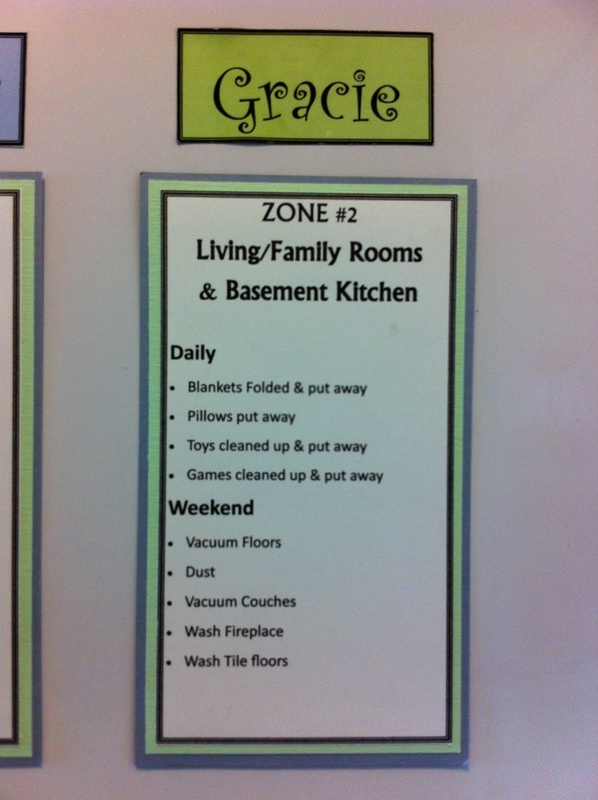 So each person is assigned a zone…FOR ONE WEEK. Starting Monday, you get a new zone. 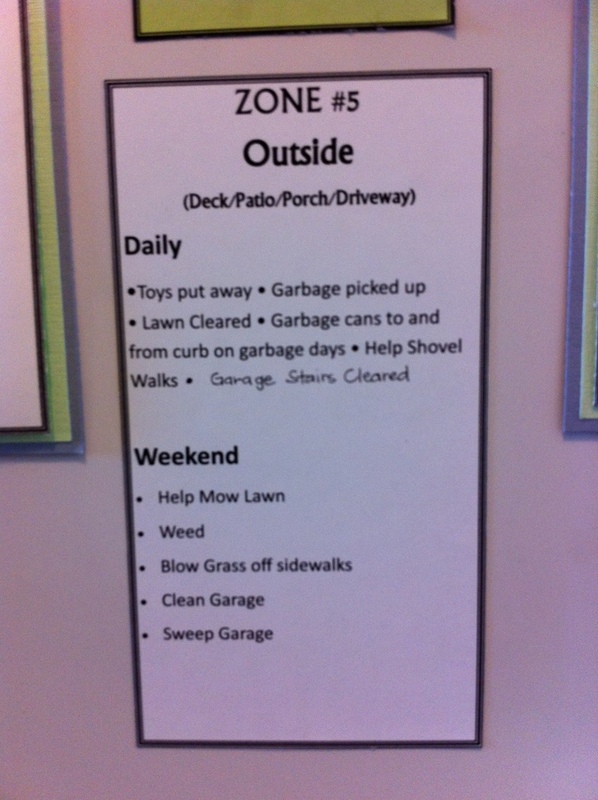 It’s your job to keep your zone looking tidy throughout the week. 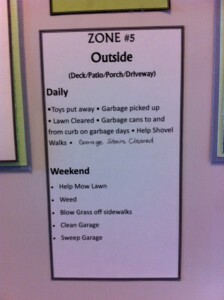 Then on the weekend, you deep clean your zone. You may think that the kitchen or bathrooms seem unfair. But, everyone is responsible for after-meal clean up. 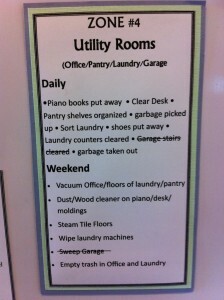 And, if you’ve got all the bathroom cleaning stuff out, why not move from one bathroom to another. Besides, you only have to do it every 5 weeks! And by having the same zone each week, you learn how to keep it clean, the right way to deep clean, and to hold others accountable for the messes they make. I love the system, however, with any system I’ve found that it’s me who needs to follow through more. That’s what keeps it a success. They have other jobs too. Each is responsible for their bedrooms, each has a section of the dishwasher to unload, and they help with and put away their own laundry. 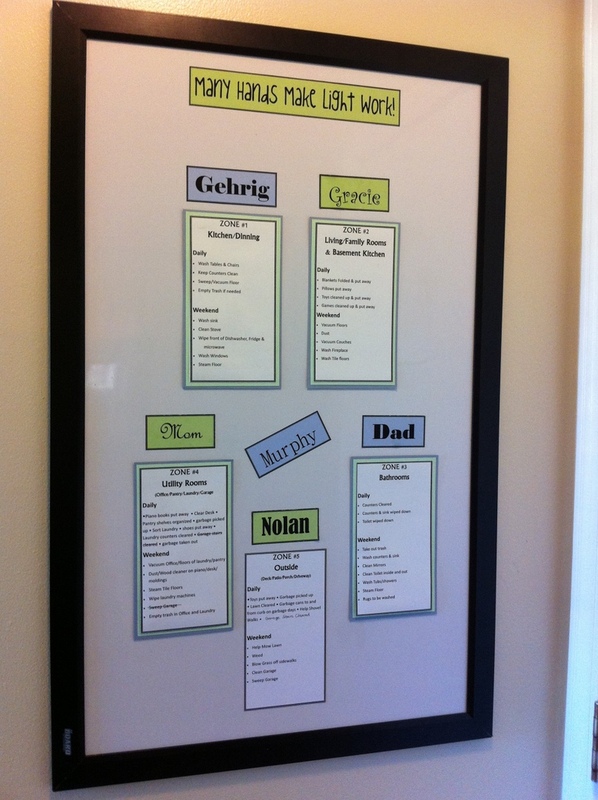 To make the zone chart, I just printed each zone/name on magnet paper and used a dry erase board! Each weekday, they can earn $1.00 if they check everything off. 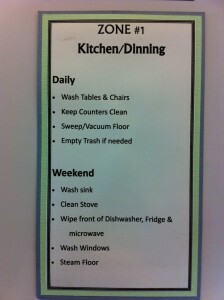 On weekends, they can earn up to $2.00, with extra jobs on their Saturday list. Bedroom and Bed are in red because if they don’t do it, they can lose up to .50. Some things are just expected!!! There are also a few blank lines and check boxes for doing extra jobs with our approval. 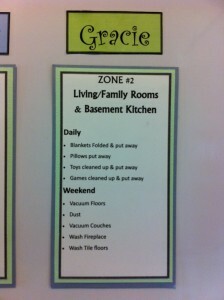 This entry was posted in Davis News and tagged chores, Zone Chart by Rachel. Bookmark the permalink. that is such a great idea! i think we are going to try and do zones. this is something i have been struggling with as well-dividing my time between my kids, and me, and finding time to clean. thanks for the idea! I saw Dustin posted about this on facebook, so I was intrigued. (I grew up in the 10th ward with Dustin’s family, in case you are wondering who in the world I am.) My boys are still pretty young, 5 1/2 is the oldest, so it’s hard to motivate them sometimes. 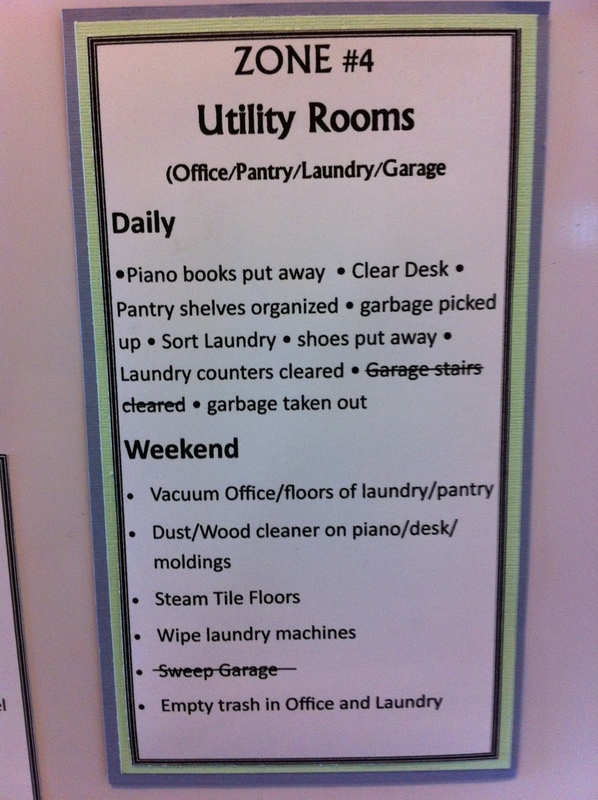 I really like what you are doing with the expected chores and connecting $ to it all. I don’t think kids should be “paid” just because they live in the house, but there is much they can learn if they earn it. I’m going to print your checklists and try it. Thanks!